Don Mancini: Chucky vs Anabelle Possible? Chucky creator Don Mancini spoke to USAToday recently and suggested Chucky could team up with Anabelle, whose movie was released in cinemas last week. It’s about a possessed doll but it is very different to Chucky. Not really sure if Mancini was joking or not with his comments since Anabelle is completely stationary and is nothing like Chucky. This article was posted October 6, 2014 at 3:41 pm. Don Mancini Talks Sequel Ideas, Chucky vs Freddy? Revenge of Chucky in the Works? 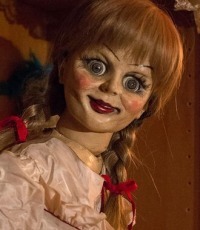 annabelle is just creepy no way I would never think about chucky ever!